Origami is a lovely ancient Japanese form of art that traditionally refers to paper folding. 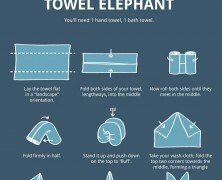 Now you can do it also with towels! Make a monkey, elephant, mouse, snake, or … with this handy guide.